The consumer may need access to a firms product to allow them to try it out before you buy it, or make purchasing easy, or to allow for the return of goods. The manufacturers need outlets for the products they make that will provide them with a large market coverage. In addition, the manufacturing would like an outlet that will appropriately promote the desired image of their product. Retailers (e.g. shops) are firms that sell goods to the final consumer. They purchase the product from the manufacturer and then mark up the price so as to make a profit. Why is 'Place' so important in the marketing mix? "Getting the right product, to the right customers, at the right price in the right place and at the right time." If Tower Records opens a superstore in Nagnuma (ask Mr. Mitchell) the company has made a mistake as its target customers do not live (or visit) that area, the price is too expensive (commute + purchase) and it takes a lot longer than simply downloading music from iTunes. How has the internet affected 'Place'? Intermediaries are agents or firms that act as a middle person in the chain of distribution between the producers and consumers of a product. 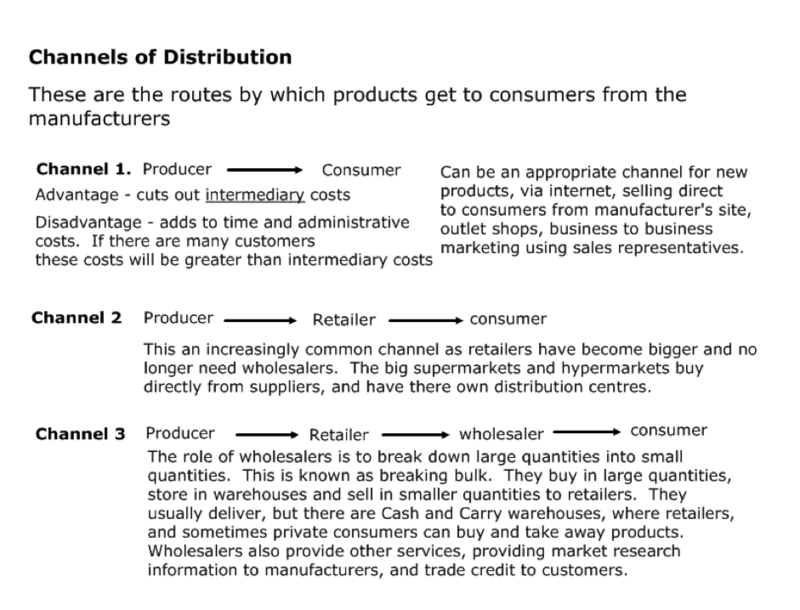 Examples include retailers, wholesalers,distributors and agents.